It's been awhile since I wrote to this blog. Initially I had planned to take a brief hiatus from writing here as I sorted out the logistics of my move to London, including finding stable work and housing. Unfortunately, just as things seemed to be settling down, it all went into madness again. My mother, having just had surgery, suffered severe complications which forced me to return to Trinidad twice within a matter of weeks. Sadly, she passed away on November 2nd 2008, and it is only recently I have returned to the UK, again trying to settle into a routine of life, now without one of my main pillars of support. Life has been a bit too chaotic of recent for me to put a proper effort behind getting into a top-tiered MBA programme, and my mother's passing has also left me asking many questions of myself, and the career I wish to pursue moving forward. All I have accomplished in my life, all the dreams I pursued, it was always with a goal of proving to my parents that they have in me a son they could be proud of, and their pleased smiles always gave me the confidence in myself to believe I could accomplish anything. Now that half of that much loved duo is no more, I find myself a little bit emptier inside, and in need of some time to adjust to that new void, to again find the strength to push forward with my MBA dreams. 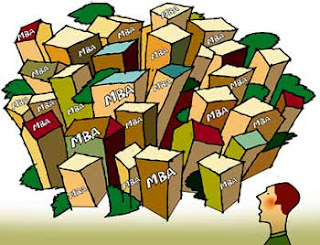 I hope one day to return to this blog with the fire and drive I had once before, ready to share the challenges, struggles and experiences in my quest to be accepted to a top-tiered MBA programme. But for now, I'll put my MBA dreams, and this blog, on hold as I simply seek to survive through this ordeal. Thank you for informing us of your relocation and your request to reschedule your exam after you have relocated. When you are ready to reschedule your exam, Please contact us referencing incident number xxxxxxxxxx. So I guess I'll be rescheduling my examination in a month or so from London once I've completed my move there. I was to rewrite my GMAT examinations on Friday. My preparations this time were a little less hectic, but just as intense and definitely better directed now that I had the experience of wriitng it once and identifying the areas I knew I definitely was less prepared for. Unfortunately my VUE centre of choice was experiencing "technical difficulties" with their computer systems on the date I set for my rewrite, and they were unable to set me up for the examination that day. They have indicated that I would be granted a resit date, however I am in the middle of relocating, so a resit date within Trinidad would not be possible as time would not permit it. An incident number was given to me, and I wrote to the Pearson Vue support email address available in my mba.com profile, but currently have no response from them. In fairness though, it has only been 2 business days, and the incident I would hope was not one that is typical, so I am assuming that the delay is administrative in nature as the evaluate how best to compensate me for the incident. Still, I believe once I get the approval I will have to delay my rewrite of the GMAT for at least several weeks because of the priority of "moving" logistics. I will update this particular post with the latest status from Vue on this incident. I am, however, left with a bitter taste in my mouth at the unevaluated preparation effort, as this time could have been more usefully used had I known the test would not have occurred. I am also left with a distrusting feeling when it comes to utilising Trinidad's testing facilities and would definitely rather do my test abroad where hopefully these types of technical issues can be better dealt with in real time so as not to avoid cancellations of tests because of "technical difficulties." For the GMAT examination I am utilising two books for test preparations. The first is Princeton Review's Cracking the GMAT and the second is The Official Guide for GMAT Review - 11th Edition. A third book, Barron's GMAT, was sent to me by an aunt very recently and which I only briefly had time to explore as I found the first two quite adequate. I chose Cracking the GMAT as it was one of Amazon.com's most recommended books for preparing for GMAT. I do not regret the choice. The book breaks down each section of the exam in a very structured manner, and introduces very powerful techniques such as Process of Elimination (POE) which are designed to help one increase one's GMAT score significantly. My only complaint about this book is that I felt that the included DVD should have offered more content than it did. The DVD felt more like a marketing tool for the student to feel trusting of the book's techniques rather than as a proper addendum to the content of the book itself. The book also has listings of top-ranked MBA programs which I used as the starting basis for my own research. One link in particular which I found very useful was to a website which assisted me with initiating the application process to multiple MBA programs from one page. The Official Guide for GMAT Review, 11th Edition was recommended as an additional buy by the Princeton Review as it contains a base of real past GMAT questions on which to practice the very techniques shown by the Princeton Review in order for one to gain trust in their viability on the field. The Barron's guide is in general a good book, covering all the theory necessary to prepare one for the examination. The technique it uses to assist students focuses more heavily on understanding the Mathematical and English language theories behind each area tested and gives very little for the student who may be stuck and looking to make an educated guess when memory fails them on the application of theory. There were two other books I had wished to acquire, The Official Guide for GMAT Quantitative Review and The Official Guide for GMAT Verbal Review, both of which contained more past paper questions and which could have done no harm in having, had I the time to use them effectively before my examination date. As it currently stands I am finding it quite challenging to allocate time just to the number of questions contained in the Official Guide For GMAT Review 11th Edition. As I continue with this regimen of full-time work and part-time study preparation for GMAT in just a few weeks, I continue to look for any tips and practice questions I can online. Prepfortests.com has been invaluable for providing these so far, as I often find myself challenged to overcome "common mistakes" when evaluating their questions for correct answers. I welcome anyone reading this to post their own sources for sample questions, or any hints they might have to better prepare for the GMAT examination. Work has been hectic the past several weeks. Both my study schedule for the GMAT examinations and research into potential universities have been hindered by demands at work as we fast approach a May 30th delivery date. That being said, it would not have been an ideal time to ask for time off anytime recently. I finally saw the right timing to ask my manager for the day I needed to take time off from work to write the GMAT as things seem to be shaping up for an on-time delivery. Since most of my preparations were already completed for a previous examination date which never happened, I am hoping the lack of study time in the last few weeks should not affect me too negatively. I estimate that I need about 3 days of intense review and mock testing in order to bring me up to examination readiness. Friday 30th May just happens to be a public holiday in Trinidad, so that allowed me to get those three days I needed without needing to take an additional day off from work. Now all I need to do is go online and book the time on the following Monday that I think will best suit me. June 2nd is now D-Day for GMAT! Some luck! I'm looking at a tentative June 6th slot, but I want to wait until the actual June 2nd date I had in mind originally to confirm this since that date is also the launch date of our new product at work. Based on how well the new MessageCentral platform hits the wild (and how many undiscovered bugs get discovered) it would be the best time to decide if the 6th is a good choice. It's confirmed - June 7th at 11am has been booked for my GMAT examination....The race to prepare is on! At my previous organisation, a place a consistent reader will probably hear about repetitively because I learned so many lessons there, one is introduced to the organisation through a week-long focused training session that has come to be affectionately called "Boot-camp". It is based on an intense agenda of sessions and workshops designed to empower the participant with the tools needed to succeed in the high-paced atmosphere and culture of the organisation. My efforts to study for the GMAT could do with me going through such a boot-camp session. Unfortunately I don't have a dedicated week to spare solely to GMAT studies. I balance my MBA efforts along with my normal daily job, my efforts to reboot a small business venture as well as my commitments to several local non-profit organisations. Thus I came up with the idea of GMAT Basic Training. It would in the end, contain all the items of an agenda for a GMAT BootCamp, but stretched over a period of time rather than compressed into a week. For my period of time I chose two months. My target date to write the GMAT would be at earliest May 17th, with June 7th being my final deadline. These dates may seem odd until one realises they are actually Saturdays. I have to write the exam on a Saturday, as the location of the exam centre is in San Fernando, a city in south Trinidad, while my full time job is in Port-of-Spain in north Trinidad, several hours away even with the best of traffic on my side. Time off from my full-time day job is not an option. I was also conflicted on whether I should discipline my efforts to a specific date, but I had to bear in mind that the dynamics of my full time job could leave me in a crunch period and in office on a particular weekend. Realistically, the flexibility had to exist somewhere for something to change if needed, and since GMAT is a flexible date exam, it is the obvious de facto candidate. I broke my GMAT Basic Training into the following two tracks which I worked on (and continue to work on) in parallel, namely, preparing for the actual GMAT examination and selecting which schools would receive my results on the day I wrote the examinations. There was a bit of meat in each track, so I'll go into details on each in its own future posting. My expectations working at Medullan were not disappointed. Of the three guys I met that day I accepted their offer, I worked closely with two of them over the course of almost the next two years. The work was hard, I was challenged in a way beyond any job previous, to stretch my previously known capacity to learn, to grow, to perform, and then once I had reached these new found limits, to stretch again beyond those. Frankly the first week of working at the pace of global business in that small office in Medford, I seriously doubted that I was up for the task at hand. I will be honest and say that I failed at times to meet what I thought were unreachable goals during my time there, but for every day that there was failure, there was the following day that I still got back up again to meet the challenges of the new day once again. Working with Medullan and these young entrepreneurs named Geoff and Ahmed, only a few years older than myself, I realised what made them different was that they were vessels filled with global leadership experience and best practices that could only have been gained from having worked with some of the best in the industry. The fact that Geoff, in particular, was a Harvard MBA graduate with MIT pedigree who constantly instilled in me ideas that raised my thinking to another level only added to the respect I had for him. They were excellent mentors and I hope whatever I achieve in life brings credit to the lessons they've taught me. They are the reason I saw how high the bar for excellence and leadership really goes, and just how much more I had to learn if I was to ever return to my dream of building Redditech into a great company and make it a successful reality. They are also a reason in my realisation that an MBA is not just a piece of paper, that if approached right, it will present oneself with the opportunity to hone one's own skills, not only to develop and create but to also debate with others of similar and different thinking one's own business ideas, and in the end, to mold oneself more purposefully into the best leader and entrepreneur one can be. "A good plan violently executed right now is far better than a perfect plan executed next week.". After moving on from Medullan, I still continue to converse with my past mentors, as often as their time allows, since building a high growth company leaves little time for idle chat. I have also started the process for piecing together the direction I wish to take Redditech into, now that I have the time available to dedicate to this effort. I have no assumptions in this brainstorming effort, even the name, Redditech, is up for revamping as I do my research into what I now believe is a survivable business idea I can implement from my home in Trinidad on a self-funded budget. I remember as well though a quote my primary school teacher gave us as we prepared for our secondary school exams. "If you fail to prepare, you're prepared to fail." Google revealed to me that Mark Spitz said this originally, but I have always kept its meaning close to me throughout my life well beyond my days as an 11 year old in blue shirt and khaki short pants when I first heard it uttered. By NOT actively searching for and pursuing an MBA which offers the correct mixture of focus on leadership, entrepreneurship and technology I am looking for, I will be failing to prepare. I am not saying that by relaunching Redditech now I am prepared to fail, I do believe that this rejuvenated effort will lead to a successful result. I do also believe though that I would benefit greatly from the opportunity an MBA experience offers to share and collaborate with others of similar thinking the "field lessons" I have learned and continue to learn, to refine them and adjust them based on lessons others have learned and through the results of these discussions become more finely tuned and crisp in my ability to execute these ideas for the success of Redditech or whatever new venture I may pursue then. I started looking for an MBA for these reasons, to grow myself as a leader and an entrepreneur so that I may achieve my highest potential in these roles, to bring honor to the effort past mentors have made investing in me, and to raise my level of thinking and ability to build a successful business venture of my own making. Up to about two years ago I wasn't interested at all in an MBA. That was something academics did for academic purposes, and having become frustrated with the local university system and its non-student-friendly bureaucracy and uninspiring lecturers during my failed run at an M.Sc. Computer Science, it was not a place I was looking to venture to anytime soon. Working for companies in Trinidad also didn't quite suit me, I might meet a few kindred spirits who liked getting things done, but more often than not the dispassionate culture that seemed to dominate all the larger public and private organisations I worked with would take their toll. Combined with my own lack of training in how to get things done successfully and my own youthful impatience at systems that to me prevented things from getting done rather than empowered folks to get things done, I'd find myself again, several months later, calling my local headhunter in the search for a "perfect" organisation that never existed. After a time I eventually resigned myself to the fact that if I were to survive in the world as a useful, contributing member of society, I had to find something I could remain stable in. I started developing my company, Redditech, which targeted small growing businesses in Trinidad looking to take advantage of lower-cost open source software solutions. It combined the best of many worlds I was passionate about. I loved getting things done. I loved being evangelical about computers and technology and finding new niches in which it made things better for everyone. I loved open source software because of the inherent community "spirit" and freedom of ideas surrounding it. At a time when Microsoft and other popular vendors weren't so "open" about sharing versions of their own software freely without a prohibitively expensive licensing cost, this was an excellent startup area for a self-funded fellow like me to be in. Things were good, or at least they were initially. Then the complications hit. Jobs were inconsistent, I had no idea about developing job pipelines or marketing myself or my company. Sometimes the work was way more than I could handle, and I would come in extremely overdue, and costs would increase. My project management and estimation skills were sorely lacking. Clients would ask for one thing, for which there was one price, and then several weeks down the road, promote several other ideas, expecting them at the same price. I had no working knowledge of what scope creep was at the time, or how to manage it effectively. I had little legal awareness either, so jobs often went on the trust of a handshake, something that left me often coming up short as just dues were renegotiated at the time of payment in a "take it or leave it fashion." In short, I was too inexperienced for the task at hand, and that inexperience was showing after a year or so by the limited funds I had left from when I initially launched into my own business, and the pending bills of the coming months that were nowhere close to being met. That was about the time I met with three guys from Massachusetts who were recruiting software developers in Trinidad for the near-shore arm of an IT healthcare solutions firm called Medullan. They had no offices in Trinidad, yet. They were still being built, but they had such a grand plan in mind they needed folks to come on board several months before this was completed. Their headquarters were in Medford, a place very far away to a Caribbean soul like me, and initially the first few folks they employed would come there to train directly with them. There was something about these guys, a connect that happened that was somewhat magical. I had met kindred spirits before, but these guys seemed to possess an insight into how the world worked and how to plan and build for successful results that made me yearn to work with them and learn from them and just frankly build something great together with them. I came in that morning looking to explore partnership opportunities for my own company, but by the end of that day I had decided without any doubt that my Redditech dreams would now be on hiatus, I was about to start on a new path building a great company-to-be called Medullan. Actually, the quest began some time ago. It's just I got a tonne of useful information from other folks blogging about their own MBA application process, and I thought it only fair to pay-it-back to the community out there by sharing my own strategies as I start seriously in my steps towards getting into an MBA program that matches what I am looking for. I currently have another blog, the Redditech Blog 2.0, which focuses more on distilling technology and business-think for common folk. The original Redditech blog is still up as well and archives my first steps in setting up blogging software as it is hosted and maintained on my personal server space. It was also my genesis in writing a blog, and I sometimes go back and read the posts there to appreciate how much my style has evolved over time, both in terms of actual writing and also content distillation. I created this blog separate from these two as I believe at heart, they are to be read by two separate audiences. I hope you find at least as many tips from this in your own MBA quest, as I have from others as I continue mine.